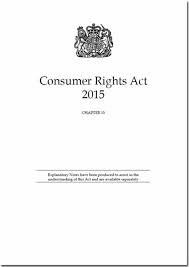 Happy Consumer Rights Act Day! A blog devoted to the consideration of matters of consumer law and policy. Brought to you by Professor Peter Cartwright and Dr Richard Hyde of the School of Law at The University of Nottingham, the entries are informed by our research, and seek to explore the interesting and important ways that consumers are protected (or otherwise) by the law.